A seemingly pointless button that popped up on Reddit more than a month ago has befuddled its members and garnered global media coverage. Now the number of "pressers" is approaching a million, and a major US think-tank has weighed in on the matter too. It looked like an elaborate April fool's joke. At the beginning of last month a mysterious button appeared on the social network - apparently without reason, and with very little in the way of instructions. "You can only press the button once," they read, "we can't tell you what to do from here on out. The choice is yours." The game consists of two simple elements - a button and a countdown clock which ticks down from 60 seconds. It seems to be heading towards zero, but in the weeks it's been online, it hasn't got there yet. Before it reaches its target, the clock jumps back up to 60 as somebody, somewhere, presses the button. This apparently thankless task isn't open to everyone. If you want to join in, you have to have a Reddit account created before 1 April, so the number of players is finite, and as the rules state, you only get to press it once. While the ultimate goal of the button remains an enigma, the game has a furiously competitive twist built in. Once you've pressed, your account is forever branded with your score, and a colour - or "flair" - to match. High numbers are easy to achieve. The counter bounces around just under the minute mark all the time as trigger-happy amateurs jump in. Their accounts are stamped with a purple dot. More patient players are rewarded with different colours. If you press the button when the counter drops to 45 seconds, you're blue. 35? That's green. Only the most diligent clock-watchers win a red dot, when the timer falls below 12 seconds. The colour divisions have split Redditors into rival clans now replete with nicknames and - if you can believe it - sprawling mythologies to match. The "Purple Conclave" are despised by the "Emerald Council", while elite players are members of the hallowed "Red Guard". 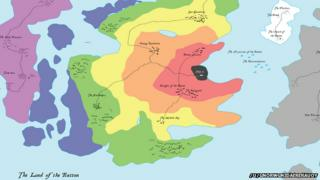 Celibates who refuse to press - marked in grey - are "Followers of the Shade", and all are featured on the "Land of the Button" map. Then there are the "Knights of the Button" who claim not to care what colour they get. Instead they're fighting for the common good, trying to keep the game alive for as long as possible. "It's a very interesting problem from a technical point of view," says Andre, a Russian computer programmer, and one of the "knights". He's spent hours designing a piece of software that helps co-ordinate other "knights" so they use their turns in the most efficient way. To some, it'll seem like a gigantic waste of time, but not everybody sees it that way. Two academics at the Brookings Institute, a major US think-tank have written an article arguing that there's real value hiding somewhere in the idle chatter. "The wild success of the button holds interesting lessons for how to develop public policies in the Internet age," claimed Joshua Bleiberg and Darrell M. West. Not all the players are convinced, however. Jeff Walker, an American who created a sub-group called "The Holy Order of Primes" which encourages others to shoot for prime numbers (because they're "more holy"), tells us his endeavour is "entirely a huge distraction".